If you are talking or writing about change quotes can add credibility. 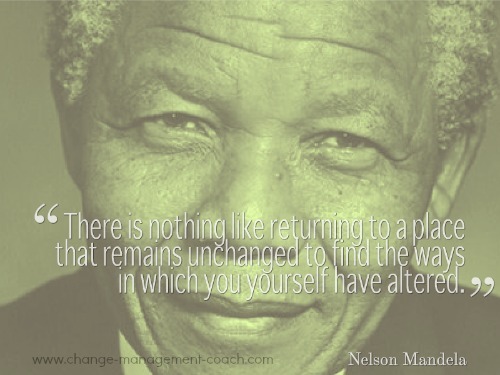 Here are a selection of change management quotes that I have found useful. These are quotes that I've carefully selected from the thousands available on the internet, and from my own reading. People relate to quotes - so use these quotes about change to inspire yourself and others. ~ Apple "Crazy Ones" advert; 'Think Different' campaign (1997). Listen to Steve Jobs narrating the first Think Different commercial that never aired. Choose change quotes carefully, making sure they are relevant to your situation. It's a good idea to use quotes about change sparingly. When we're facing change quotes can be powerful, but they become meaningless if there are too many of them. I've discovered that change quotes are excellent for personal motivation and inspiration. If you want to transform your life or are searching for new possibilities select an appropriate change management quote from this page or discover more quotes about change. Make a few copies of the quote and place it so you read it often. Some of my favourite places are in my car and on on my computer screen. Read it often and it will slowly become part of your new reality. Change quotes are like your personal coach, inspiring you every time. Everything passes. Everything changes. Just do what you think you should do ~ Bob Dylan (1941 - ), "To Ramona"
Leave your favorite change quotes below and keep in touch by visiting our Facebook Page and clicking 'Like' to join the community.